Last time we talked we were talking about the shot for/shot against ratio. We were using the metric to demonstrate effort, or lack of it, on behalf of the Flames. The lack of effort manifested itself in more concrete ways, for example, the lack of scrums after the whistle, but because we don't have a stat for that, we used shots for/against instead. The above is the raw. How did it corelate to points totals? Now our own personal feelings on this is that the data is hiding things. For instance, over the course of a season, the top team in the league is going to sleep walk through some games. They may only show up to play for one period out of the three. The top team(s) can do this because they are that much better than their opponents. So we can see the shot totals be skewed because of talent factors and things like that. 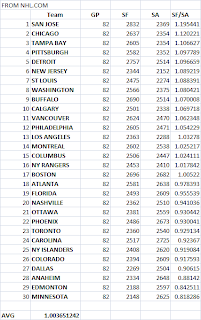 The Coyotes and Predators having such a discrepancy between point total and sf/sa rank speaks to this. Those two teams have a counter punching style of play; They are going to give up more shots than they are able to take by design. Generating shots for the sake of generating shots is not the be it and end all of team construction. in other words. Defensive hockey teams can also enjoy success. It appears that over the course of a season, the sa/sf ratio is too rough a stat to give us a gauge of a teams potential for success. (or for why the team had success). And that makes sense: Shot quality exists. 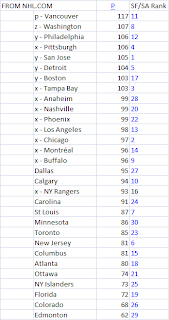 100 shots from the red line are not worth the same as 100 shots from the slot. 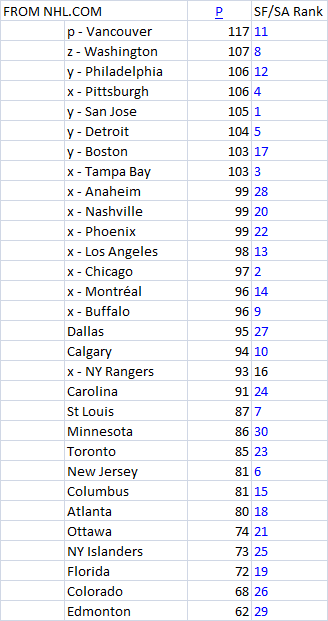 Generating shots from the slot is harder than generating them from the red line, so it makes sense that a team that is going to the slot before attempting to generate their shots (ie: good teams) may have their shot totals suffer as a result, even though their chance for success may improve. What are we trying to say? Nothing new. If a team has immense talent (compared to it's opponents), it can get by not giving the effort every game. The 'play to the level of the competition' effect. Conversely, if a team lacks talent (and probably more weighted to offensive talent) but gives immense effort (and effort can be described as many things; here, for example, we could use the Predators players diligently playing a system) they can also win some games the talent level would say they should lose. A successful team combines talent and effort. Shocking. If a team is bad it is because it lacks both talent and effort. Colorado and Edmonton were bad teams last year; Edmonton lacked so much talent no amount of effort was going to overcome it, and Colorado was reportedly wracked with locker room issues, which will effect effort, and the play of the talented players. Calgary does not have a surplus of talent. We know this, but we also know that a team can get by this handicap (at least until the playoffs) if it gives effort. 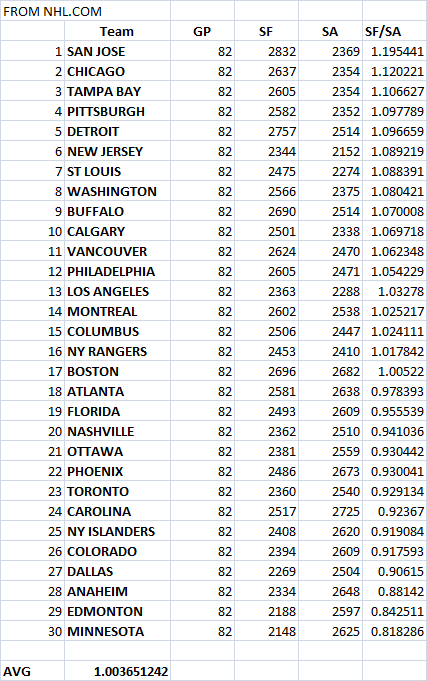 That was the whole second half of last year, outworking teams that were less talented than Calgary. But Calgary has shown through the first two games of this season that it does not want to play with effort. This could get ugly, fast, as a result. If the team continues to play this way, how long does the organization let it go? What if we go 0 - 5? If the organization is super serial about making the playoffs and challenging for the division (which is admittedly laughable) it may not be able to wait a prolonged slump out and keep their collective noises from growing. The roster has a lot of deadwood on it, expensive deadwood with NTC's. The GM just got hired, and King is entrenched. The Coach is on the hot seat, and Craig Hartsburg is not the solution.